It’s scary to see someone suddenly collapse. But that is exactly what happens when sudden cardiac arrest (SCA) strikes. SCA happens without warning and is witnessed by someone nearby nearly 50% of the time.1 That witness could be you. But would you know what to do? Don’t panic. You can help. First, check the area for safety. Is there traffic, a gas leak, a fire, downed power lines? You do not want to put yourself in danger and become a victim yourself. Check for responsiveness and call for help. Once you’ve determined that the scene is safe, check the victim for responsiveness. Look to see if the victim is breathing and if he/she has a pulse. If the victim is unresponsive, ask someone to call 911 and to find an automated external defibrillator (AED) while you start CPR. AEDs can be found in many public places such as schools, office buildings, churches, and fire stations. Take a look around to notice where there are AEDs in your community. Apply proper chest compressions. Chest compressions should be delivered at a rate of 100 to 120 per minute and a depth of 2 to 2.4 inches. Try to avoid leaning on the chest and minimize the time you pause between compressions. Providing CPR is extremely important and can help make the difference between life and death. Follow the AED prompts. When the AED arrives, turn it on, attach the pads to the victim’s bare chest, and follow the prompts. If the AED advises a shock, make sure everyone stands clear until the shock is delivered. If the victim remains unresponsive, promptly resume CPR until medical personnel arrive. Help save a life. The first few minutes after a collapse are critical. You can provide the much needed CPR and help increase the victim’s odds of survival. 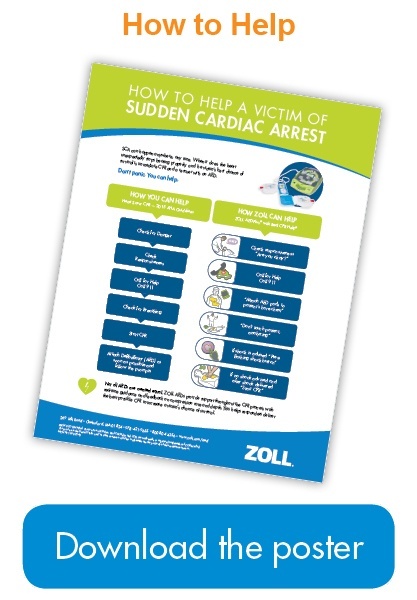 Download a PDF or order a poster with step-by-step guidance on assisting SCA victims and using a ZOLL® AED. Sudden Cardiac Arrest: Do you know the facts?